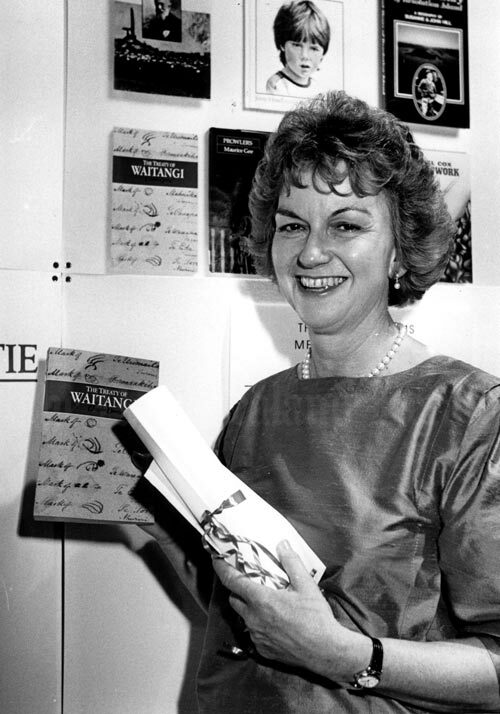 Claudia Orange poses with her book, The Treaty of Waitangi, on the occasion of winning the Goodman Fielder Wattie Book Award in 1988. The Treaty of Waitangi was a major publishing success and sold thousands of copies. Its success was an indication that by the 1980s there was a market for serious well-researched books of New Zealand history. The book began as Orange's PhD thesis, and she went on to make a major contribution in public history as the general editor of the Dictionary of New Zealand Biography and then director of the Collections and Research Group at the Museum of New Zealand Te Papa Tongarewa. Photograph courtesy of Claudia Orange.